The famous Odawa War Chief Pontiac was believed to be born sometime around 1720 near present-day Detroit, Michigan. The Odawa Tribe he descended from were related to but, distinct from the Ojibwe and Potawatomi and, settled in this region after the 1600’s. Their language was a part of the Algonquian language family and, in the English translation, we get the names for Ottawa, Ontario and the Ottawa River. For most of his life, his people were allied with the French and fought against British encroachment. 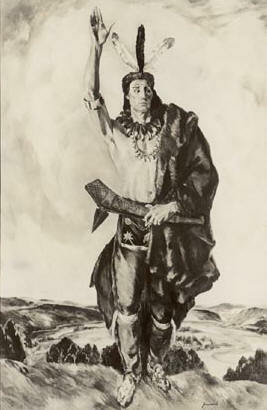 Pontiac first rose to prominence, when as an Ottawa War Chief he joined the French fight against a resistance movement of different Indian Tribes led by the Huron leader Nicholas Orontony in 1747. His close alliance with New France continued up to and throughout the 7 Years Wars also known as the French and Indian War from 1754 to 1763. In this conflict, he led war parties against the British Colonist, and their Militia, as well as British Troops. Fighting for the French brought him to the attention of British Military Leaders as a serious threat to their victory over France for territory and dominance throughout the region. After the British won this war and gained new territory from France, Pontiac continued in his resistance against British and Colonial expansion. Many Tribes in the Great Lakes Region resented the new policies imposed by the British and expansion of Colonies into their territory’s. Pontiac in a famous Indian council held in April of 1763 inspired the listeners to rise up against the British and began a raiding campaign. They attacked Forts and settlements throughout the Great Lakes region, killing hundreds of Colonist and destroying 8 Forts and causing many to flee the area altogether. Fort Detroit is where hostilities first began under Pontiac’s leadership and thus became known as Pontiac’s War. However, as word spread of the attack, the revolt took on a life all off its own and, soon other Tribes joined in the rebellion all along the Great Lakes Territory. Pontiac’s attack on Fort Detroit turned into more of a siege as he and his warriors were unable to penetrate the Fort and defeat its defenders. This allowed the British time to send Troops and mount a counter-offensive against the Indian uprising. Skirmishes and small battles continued for over a year when the British decided a better approach to secure peace with the Indians was through negotiations. Peace talks were held and treaties were signed with Tribes throughout the disputed territories and, George Croghan representing the British was sent to negotiate with Pontiac in Illinois in the summer of 1865. Pontiac agreed to travel back to New York to meet with William Johnson at Fort Ontario and a formal treaty was signed in July 1766. The conflict had cost the lives of 450 Soldiers and 2,000 civilians killed or captured. Native American casualties were at least 2,000 but, no accurate count was made at the time. It is largely counted as a stalemate by historians today however, The Indians were forced to accept British sovereignty and this helped in contributing to Pontiac’s fall from power as a Leader. Furthermore, it most definitely did not prevent Western expansion by the Colonist. After the War Pontiac was forced to relocate from his Ottawa Village on the Maumee River to Quiatenon on the Wabash River in Illinois. A noted British Frontier Soldier Robert Rodgers had much to do with Pontiac’s enduring legend rather than his own actual significance of the time. Upon his return to England Rodgers wrote and published a Stage Play Titled ‘Ponteach: or the Savages of America’ and, this play started Pontiac’s rise to mythological fame. In reality, Pontiac’s last years were spent in obscurity and disgrace. He was tragically murdered in 1769 by a Peoria Warrior seeking revenge for an Uncle Pontiac had badly wounded back in 1766, who was a Peoria Chief. This took place near the French Town of Cahokia and, many believe this is where he was buried, others claim his body was taken to a famous Indian Burial Mound near St. Louis. The City of Pontiac was named for him as well as the one-time General Motors Automobile Line.